and her brother on bass. In the autumn of 1996 the band began working on their first album "Roll out the carpet", which was released in 1997. It's a record crammed with rough distorted guitars and finely tuned harmonies mixed with varied and compelling refrains. The same year the slightly rougher "Supersongs" EP was released to wide critical acclaim. and needed an orchestra, Three Blind Mice would be the definite band for the job. The catchy choruses seem to be their trademark on songs like the debut single "Say a prayer", on "Baby boy", "Wrong man"
album which is planned for release in 2000. 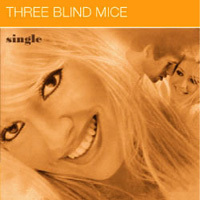 "did you ever see such a sight in your life as three blind mice?" this is a line from a well known children's song. those were the days when being alone did not matter - most of time it did not even happen because there were always friends to come around and play with you. "single" seemed to be a foreign word; okay, we have grown up (a bit at least) and now we have experienced what "single" means - and that 7" singles are our only faithful companions during good and bad times. "single", their first release on apricot records, comes as a 7"-single, limited to 800 handnumbered copies and a cdep - and is available for singles, couples and pets.